I'm really enjoying the new ABC show "Flashforward" - at this moment I'm one episode behind and just about to catch up. From a Quantum Mechanics point of view this is an interesting point to be: I don't know if that next episode, there in my Tivo DVR, is the best episode yet, or if it's just ok. Until I observe it, it's both, according to QM. Quantum Mechanics is a truly fascinating arm of science: it literally seems to break down to, for all intents and purposes, magic at the basics. We've observed a particle cease to exist in one spot and appear in another without existing in the space inbetween - teleportation. A split particle, whose halves vibrate identically from stimulus on one no matter how far apart they are may prove the key to faster than light (indeed instantaneous) communication over great distances in space - explaining how Captain Kirk and all those admirals could hold a conversation without delays in it light years apart. The premise of Flashforward is that everyone on Earth simultaneously has a vision on what they'll be doing for 2 minutes and 17 seconds at the exact same time six months into the future. A fascinating idea. Some people see themselves in new jobs, which they go out and apply for after their visions. Others see unhappy changes in their lives that they hope won't actually unfold. Still others see nothing at all, leading them to believe they'll be dead in six months time. 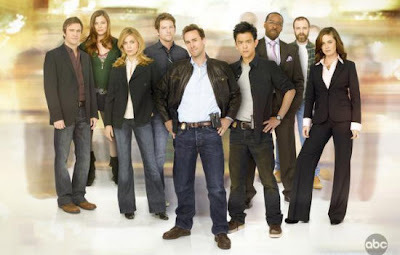 What's interesting, though, is that while many of them see themselves in a position that is created by the flashforward - like the FBI agent Mark Benford who literally sees himself investigating the cause of the flashforward, using clues seen in the future to guide his investigation in the present - none sees what is the most obvious thing that will occur at that moment: a pause, like midnight on New Year's Eve, as we reach the moment we have seen, feared, and anticipated for the last six months. One flashforward overhears a newsman on TV describing a senator's scandal - in fact, wouldn't he be saying "Here it is, we've reached the moment that changed the world when the global community saw it six months ago!"??? be aware of having been seen in the past (whew!) does not make for good TV. Rather than getting an immutable view of the future, the world in Flashforward seems to have been placed in a six month long Schrodinger's box - but given the view of one possible outcome. It's already clear on the show that's not the only possible future, as Agent Al Gough commited suicide to avoid his future vision of a world in which he accidentally killed the mother of two young boys. Despite having seen a future for himself, he now undoubtably will not fulfill it. Both states - alive and dead - were possible outcomes of the six month long box. 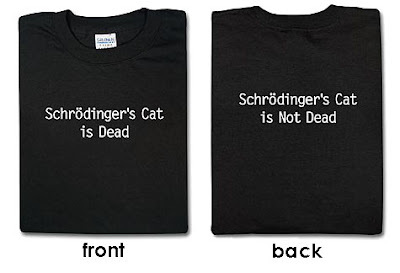 If you're not familiar with Schrodinger's Cat, Wikipedia can help you out here. 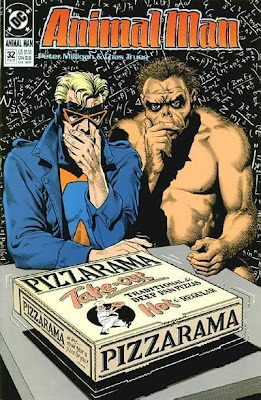 Animal Man - one of the better, most underused characters in the DC Universe (for reasons I'll hope fully explain here one day) once described the thought experiment using a pizza, a hot pepper package in the box being either broken - making the pizza too spicy to eat - or whole, leaving the pizza edible. I only mention this because I really liked Animal Man, and I hung this comic on the wall for a long time. realizing this is the vision described to him, whirls around with gun in hand to get the drop on his assailant - only to be set upon by the assailant, in the shadows that were directly in front of him, now choking him from behind. Mulder's vision was not a box with two possible outcomes, it was truly an immutable future, and any twist and turn he made to avoid it only brought him closer to it. Poor Schrodinger's cat. Or not. As long as you don't open the box, it's okay to feel fifty percent sorry for him. 6) Peanuts characters (Spike and Shermy from Schulz museum). 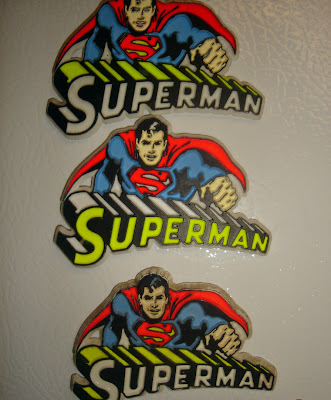 The reason for keeping multiple Superman and Robin magnets, is they have different color schemes, so as a true completist collector I have to keep one of each variation. What are two types of Kryptonite besides Green and Red? Over at Questionable Content this morning, Jeph Jacques has depicted a typical interaction between a comic artist and a super fan. Check it out here. 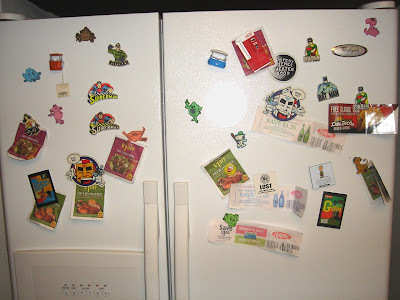 Taking a close look at my refrigerator, it's clear it belongs to a collector. And, that I like Pollo Loco. Some of these magnets I picked up here and there, because they happened to fit my interests. Chief here are the plastic DC magnets that I got as a kid. Very textural and bright, I bought these when I was a very young collector, and you don't see them much anymore. And who can believe they did a magnet of the Riddler? How cool. I vaguely remember they might've done the Penguin as well, and I'm always keeping an eye out for any I don't have. There's also a complete set of Freakies magnets here. I'll be writing more about Freakies shortly, but basically they're cereal-selling monsters that completely captivated me in the early 1970s, despite their distinctly unappetizing appearances. You'll see seven of them on the fridge, that's all of them. Now, I've got a spare Superman magnet (besides even the two you see here) and I thought it would be interesting to give it away to a reader here. So, I'll mail it to the first person who can correctly answer the questions below. 1) I count 9 different categories I collect on this fridge, including Freakies and superheroes. Please name five of the others. 2) I have two Superman magnets and two Robin magnets. Can you see why? (Hint: it's a collector thing). Please send your answers to fancollectorgeek@earthlink.net. This is open to anybody, whether I know you, am related to you, or you live on the other side of the globe. I'll post in comments when someone has completed.